Approximate times (ET) for Mercury's transit across the Sun on Nov. 8, 2006. The planet Mercury has just finished up a very poor apparition in which it is has dawdled low in the western evening sky for the past few weeks. It has now disappeared into the bright evening twilight, but by later in November, in contrast to its recent poor evening performance, it will be readily visible as an increasingly bright starlike object low in the eastern sky around the break of dawn. But Mercury is also scheduled to make a most unusual - albeit brief - appearance on Nov. 8 [image]. On that day, more than half the world [image] will get to see a rare event - Mercury crossing the face of the Sun at inferior conjunction. Observers throughout the Americas, as well as across eastern Asia, Australia and New Zealand will be able to observe all or at least part of this striking celestial phenomenon with small telescopes, as the innermost planet slowly crosses in front of the solar disk. Such a phenomenon is known to astronomers as a transit. Mercury and Venus are the only major planets we can ever see crossing the face of the Sun. Transits of Venus happen less than twice a century (the next one is scheduled for June 6, 2012). Those of Mercury are some 10 times more frequent. Nonetheless, only 14 transits of Mercury occur during the 21st century - or about seven years apart on average. The November 8 event will be the second Mercury transit in this century, the first having occurred in May 2003. The entire transit will be an east-to-west passage taking just 4 hours and 58 minutes. The Sun will be above the horizon for the entire transit over western sections of North America, much of the Pacific Ocean (including Hawaii), New Zealand, and a small slice of eastern Australia and adjacent Tasmania. Take note that since they are all located to the west of the International Date Line, eastern Asia, Australia, Tasmania and New Zealand will experience the transit on the calendar date of November 9. For all of these locations, it will be morning and with the exceptions of New Zealand, easternmost Australia and Tasmania, the Sun will rise with Mercury already on its disk. From the United States, those situated to the east of a line running from roughly Bonners Ferry, Idaho to El Paso, Texas will be able to see the beginning stages of the transit, as Mercury moves onto the lower left part of the Sun. 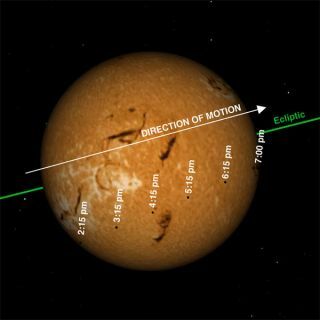 Mercury's transit will begin within a minute of 19:12 GMT (Greenwich Mean Time) at every site from which it is visible. That translates to 2:12 p.m. Eastern Standard Time or 11:12 a.m. Pacific Standard Time. Unfortunately, for most of the United States, local sunset will intervene before Mercury can move off the Sun's disk. Prior to sundown, however, the speedy planet should be recognizable moving across the lower portion of the Sun as a tiny, black, sharp-edged dot, having only 1/194 the Sun's diameter. As you watch, the gradual travel of this dot will bring it toward the Sun's right edge. This will be an especially interesting time. The moment when the two disks become internally tangent is known as Contact III. For those western U.S. and Canadian locations where the end of the transit will be visible, Contact III should occur within several seconds of 4:08:16 p.m. Pacific Standard Time. Egress then lasts just short of two minutes until the last notch in the Sun's limb disappears, marking Contact IV, which should occur within several seconds of 4:10:08 p.m. Pacific Time. With a large, filtered telescope at high power (see the "Warning" below), see if you can time when Mercury's edges cross the limb of the Sun. Perhaps you might briefly catch sight of the so-called "black drop" illusion around the moment of Contact III, where Mercury's disk appears stretched like taffy (by atmospheric seeing) toward the Sun's limb. Another way to describe it is that the planet will seem attached to the Sun's limb by a thin black column or thread. For Europe, Africa, and the western two-thirds of Asia, the bad news is that absolutely none of the transit will be visible, since the Sun will have set some hours before it gets underway. At NASA's Eclipse Home Page there is a listing of predicted contact times and the corresponding altitude of the Sun for over a hundred cities around the world with an emphasis on Canada and the United States. WARNING: Transits of Mercury are not visible with the unaided eye. A telescope must be used, magnifying at least 30 to 100 power to bring out the "dark dot" of Mercury in silhouette against the Sun's disk. To see Mercury as an actual disk will be a challenge because its angular diameter is small, only 10 seconds of arc at this inferior conjunction. As Mercury moves across the face of the Sun, it will appear absolutely jet black in contrast to the lighter gray of any sunspots that may also be present on the solar disk. Eye safety is always a prime concern when dealing with the Sun. Observing a transit is a lot like studying sunspots because, after all, you are looking at a dark spot on the Sun. But trying to see a transit is also like trying to view a solar eclipse. You have to be ready at a particular time, and you may have to travel far from home. Your exact location, however, is much less critical than it is at a total solar eclipse. For those in North America where this will be an early morning event, your observing site should have a low horizon to the east-northeast. It is a good precaution to check the sun's rising point a day or two beforehand, to verify that trees or buildings do not block your view. Projecting the Sun's magnified image through a telescope and on to a white card or screen is relatively safe and can be used for group viewing, but remember that Mercury's disk will be quite tiny. For serious transit observing, a telescope with a full-aperture solar filter is much better. Such filters are attached on that side of the telescope that is facing the Sun, not the side facing your eye. This will cause most of the sunlight to be filtered out before entering your telescope. The transit should be watched only with an appropriate solar filter - a solar filter that is sold by a reputable outlet of astronomical equipment. If your telescope comes with a filter that screws into the eyepiece, discard it immediately! Such filters have been known to crack under the intense heat of the Sun's magnified image. Lastly, never look at the Sun directly through your telescope, even through your finder scope. It is strongly advisable to cover the finder before the transit, so as to avoid looking through it accidentally. Should poor weather hinder or completely obscure your view of Mercury's transit, the next one will come nearly a decade from now on May 9, 2016, and will be visible from the Americas, Europe, Africa and central Asia. Joe Rao serves as an instructor and guest lecturer at New York's Hayden Planetarium. He writes about astronomy for The New York Times and other publications, and he is also an on-camera meteorologist for News 12 Westchester , New York.